Highlighting these aspects to be fully under her (AzhwArin the feminine form of parAnkuSanAyaki) own disposal, AzhwAr speaks imitating emperumAn; those who care for AzhwAr (i.e. mothers) observing her state, explain that to the curious ones who are in close proximity; this is explained as a mother would explain to those who enquired about the state of her daughter who imitates the aspects of ISwara, her divine consort, as the gOpikAs (cowherd girls) imitated krishNa [in separation]. In previous decad, AzhwAr had equal joy and sorrow; when both were together, joy should became prominent, but due to her [AzhwAr in feminine form] misfortune, sorrow became prominent; her sustenance by meditating upon emperumAn also became lost, and she only remained weakened due to non-attainment of physical experience; parAnguSa nAyaki who is weakened as a result of separation in this manner, tries to sustain herself by imitating bhagavAn. Like those who set out to advice others, she sat in a posture with gyAna mudhrA (instructing posture) like gIthOpanishath AchAryan [krishNa, the speaker of SrI bhagavath gIthA]; seeing that, her mother doubted “is this change due to some mystic gem, manthra or medication?”, but since she did not find any such evidence, she comes to know that it is not the case; now, due to her own bewilderment, the mother cannot understand “she is sustaining herself by imitating him to overcome the suffering in separation”; at this time, her relatives arrive there and enquire “what is going on here?”; as the mother does not realise the truth, on observing her words which resemble emperumAn‘s and on seeing her gyAna mudhrA posture, she says “emperumAn must have possessed her body”. When there is suffering in separation, it is common to see them sustain by imitating their beloved person. In thiruvAyppAdi (SrI gOkulam), the gOpikAs sustained themselves by imitating (enacting the activities of) krishNa; SrIvishNu purANam 5.13.26 and 5.13.27 “… krishNOham Esha lalitham vrajAmi AlOkyathAmgathi: …” – she [one gOpikA] said “I am krishNa; look how amazingly I walk; whoever has eyes, please see”. “dhushta kALIya thisthAththara” – one gOpikA pretended to be kALiyan and another one climbed upon her and danced on her. The gOpikA who enacted the role of the inimical kALiya thought “at least this way, krishNa’s feet will touch my head”; the gOpikA who enacted the role of krishNa became too immersed in her role and hence stomped on the other gOpikA thinking her to be kALiyan. Since they are immersed in krishNAvathAram only, they enacted those pastimes, but since parAnguSa nAyaki was divinely blessed with faultless knowledge and devotion by emperumAn, she is imitating the lord of ubhaya vibhUthi (spiritual and material realms). As she is incapable of taking even a single step, it is not physical enacting, but is visual enacting through her speech. Thus, the divine mother of parAnguSa nAyaki thinking “my girl who is born in parathanthra janmam [subservient birth – female], could recite the words of bhagavAn who is supremely independent by birth [i.e., naturally], she who is the epitome of femininity could recite the worlds of the lord who is the epitome of masculinity; while she has the knowledge to know [who is the supreme], she spoke the words of sarvagyan (omniscient lord)”, replies to those who enquired about her. In the previous decad, AzhwAr enjoyed emperumAn‘s distinguished physical form through visualisation, and that divine physical form is SubASrayam (auspicious target of meditation). [Now she is ] experiencing bhagavAn‘s svarUpam [true nature]. Due to such overwhelming experience, AzhwAr starts thinking himself as bhagavAn as seen in SrIvishNu purANam 6.7.95 “thadhbhAva bhAvamApannas thathA sau paramAthmanA – bhavathyabhEdhI” (A chEthana (AthmA) who attained the qualities of sarvESvara, in liberated state becomes non-different from paramAthmA), and in bruhadhAraNyaka upanishath 3.4 “aham manurabhavam sUryaScha” (vAma dhEva rishi who realised brahmam said “I have become manu, I have become sUrya” and in SrIvishNu purANam 1.19.85 “maththas sarvam aham sarvam mayi sarvam sanAthanE” (prahlAdha said “Everything originated from me and everything subdued into me, who is eternal) – as one thinks about self as bhagavAn himself, he/she will speak like bhagavAn; in that manner, parAnguSa nAyaki elaborately enacts emperumAn’s speech in vibhUthi adhyAyam (SrI bhagavath gIthA 10th chapter). 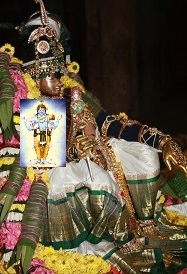 In atharva Siras, rudhra elaborately spoke about his own glories; Sruthi (vEdham) itself wondered “while he is not in control of this world, what is the reason for his speech?” and itself concluded that he spoke like that due to being possessed by paramAthmA as in “sOntharAth antharam prAviSath“. When one acquires such emotion [of deep meditation on bhagavAn], one will speak like that. Thus, the divine mother of parAnguSa nAyaki, without realising “parAnguSa nAyaki is imitating and sustaining herself during separation from emperumAn”, replies “it looks like she is possessed by sarvESvaran” to those who enquired about her. This entry was posted in thiruvAimozhi, thiruvAimozhi 5th centum on July 21, 2017 by Sarathy Thothathri.